The Wampler Ethereal Delay and Reverb pedal is a fun and useful multi effects pedal from one of the most reputable pedal builders in the US. Though we are typically wary of pedals that try to combine multiple effects into one package, we were pleasantly surprised by the Ethereal’s functionality and intuitive layout. Feedback: adjusts the quantity of repeats, with the range spanning one repeat to endless repeats. (We are assuming that at the highest feedback setting, the delay will continue to repeat forever…we only left our endless repeat running for about 10 minutes, but it was still going strong by the time we switched it off.) Something about this control that is worth mentioning is that when combined with the other controls, this pedal has the capability to flawlessly generate each and every subsequent repeat, without any perceptible signal degradation. 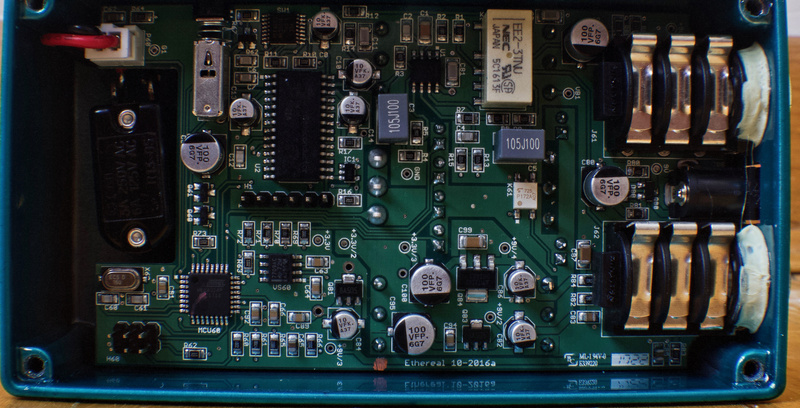 This is one of the features of a digital delay pedal. Whether this is something that you like is up to you, but know that if you are looking for pristine, studio-quality delays, the Ethereal can do it. The feedback control also allows you to adjust the reverb level, so keep this in mind when setting the feedback. 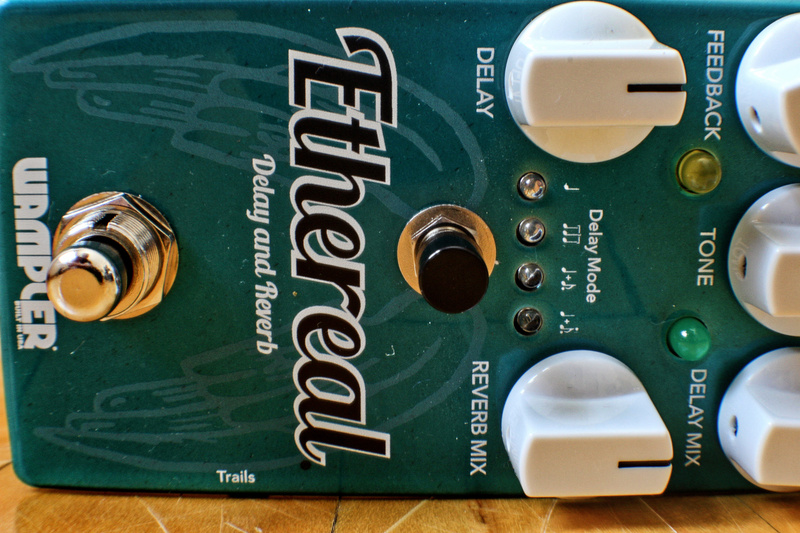 In addition to the standard feedback effect, the Ethereal is capable of some more experimental sounds, thanks to its ability to produce delay and reverb that self-oscillates. Simply turn the feedback knob up past the 3 o’clock point and listen as the pedal doubles over on itself in a very satisfying way. You can even take this effect one step further by then cranking the feedback knob down, for some of those warped, downsampled sounds. Tone: adjusts the pedal’s overall EQ. Turn the knob down for a warmer, softer sound, and turn it up for more treble and attack. This knob becomes quite useful when adjusting your signal so that it sits in the mix just right. How you set this knob can mean the difference between sounding like David Gilmour or The Edge. Delay Mix: adjusts the ratio of delay-to-dry signal. If, perchance, you wanted to use this pedal only for the reverb, you could turn the delay mix knob all the way down and completely bypass the delay function. At its fullest setting, the delay mix knob will cause the pedal to push out a fully “wet” delay signal. Typically people want something in the middle, but be aware that this knob is also important to remember when adjusting the feedback and tone controls, and can be thought of as the final step in fine tuning the actual sound of your delay. Delay: controls the total delay time. This knob is conveniently paired with a bright yellow LED light that flashes in time with your delay setting, so you can get it set just right without having to make a sound. This can be useful in a variety of live settings. Wampler has provided a generous range of delay times here, with the lowest setting producing 20 ms of delay, and the highest setting producing 1 full second (1000 ms) of delay, so you can go from 50’s style slap-back delays to self-harmonizing, Brian May style sounds. Reverb Mix: adjusts the level of reverb that is blended in with the rest of the signal. Like the delay mix knob, this knob spans a wide breadth of sounds, and allows you to go from no reverb, to a little bit of spring-style echo, to full on ambient wash. Similar to the other controls, the reverb mix is responsive to the other settings on the pedal. For example, adjusting the tone knob will determine the character of the reverb. Turn up the tone knob to approximate those springy sounds; turn it down and crank the reverb mix to blast off into ambient shoegaze bliss. Delay Mode: is actually a bit more complicated than it seems at first. While it looks like it would control the subdivisions of the primary delay sound, in fact it controls the subdivisions of the secondary delay sound. So when you engage this feature beyond the left-most setting (indicated via bright LED) what you are actually doing is layering another delay patch on top of your existing delay signal. This is an elegant way of emulating the complex, polyrhythmic delays typically associated with stereo units, and it actually sounds quite good. Each option (1/8 note, triplet, 1/4 note + 1/8 note) adds a an extra dimension of delay, and can serve both rhythmic and atmospheric purposes, depending on the settings of the other controls, particularly the tone control. N.B. The note values of the delay mode are relative to the primary delay setting being a 1/4 note. Of course, the primary delay can be any subdivision you want it to be in the context of your song or set, but you will just need to further subdivide the secondary delay values appropriately. In other words, you can think of the delay mode values representing ratios relative to the primary delay. Trails: is basically just a bypass switch, BUT in the context of a delay unit, the bypass function is much more apparent than it would be with many other effects. With the trails button in the OUT position, the delay and reverb effects cut out as soon as you step on the switch to turn the pedal off. With the trails button in the IN position, the natural decay of the effects are allowed to “ring out” once the pedal has been turned off. Both options are useful: in most cases of conservative delay and reverb usage it is likely preferable to have the tails engaged; however if you are using this pedal to create some very abstract textures, it is nice to have the option of engaging the bypass so that you can cut all of the processed signal off and keep the repeats and echoes from getting away from you and potentially ruining your set. As always it is nice to have options and Brian Wampler seems to understand this, being an experienced player himself. 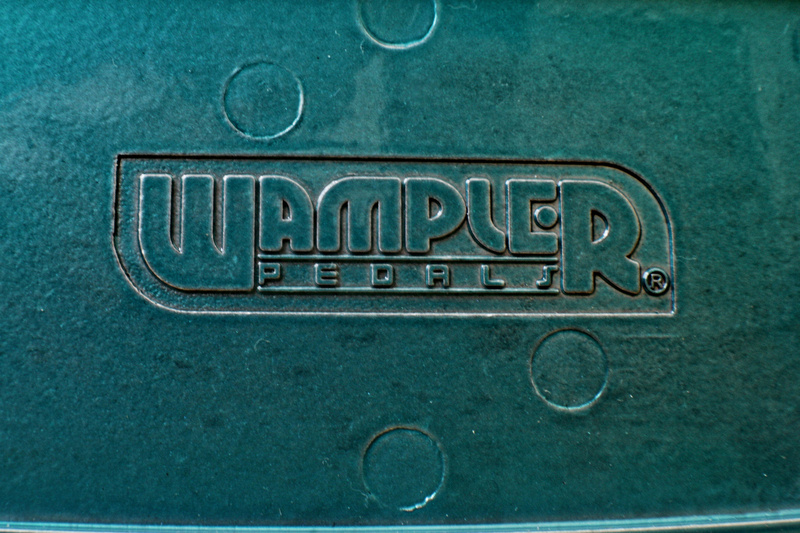 We were ready to dislike this pedal for the same reason that we were wary of VCR + DVD combo units fifteen years ago: typically one feature greatly outshines the other, making the other a huge waste of money and space. However, the delay and reverb play so well with one another, and the function of the knobs are intertwined in such an elegant way that there is actually nothing wrong with this pedal being a double duty device. 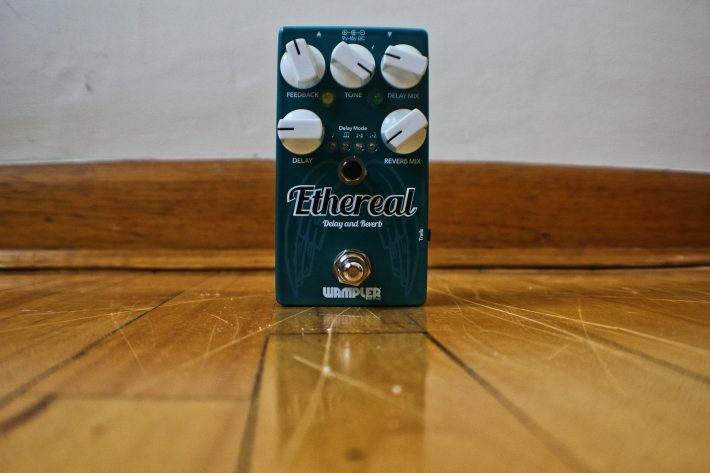 In fact, some of us are seriously considering swapping our separate delay and reverb units for the Wampler Ethereal. The sounds are quite good, the functions are all useful, and the construction is solid. 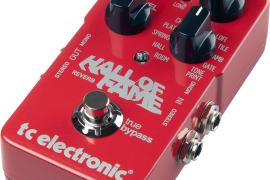 Perhaps best of all, this pedal, despite being a boutique offering, is still less expensive than two separate pedals, and that really makes it a good deal. Plus, it is made in the USA if that kind of thing makes a difference to you at all. If you are looking to add a delay or reverb unit (or both) to your setup it would benefit you to go check out the Wampler Ethereal Delay and Reverb. OH AND THE SWITCH IS A SILENT SWITCH! True, some people prefer the feeling/sound of the traditional, clicky switches, but A) this pedal has an LED to let you know that it is on, and B) often delays and reverbs are used during relatively quiet sets, where a loud click could bring listeners out of the experience. We like this feature, like, really like this feature. More companies should use these switches. At least we think so.